Clarke's Weaver was described 100 years ago but its nest and eggs have not been found in spite of much searching by birders and ornithologists. 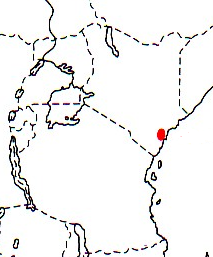 This weaver is restricted to an area of 535 km2 around Arabuko-Sokoke Forest and the Dakatcha woodlands in SE Kenya (see map left). This species is most often seen foraging in flocks in the Arabuko-Sokoke Forest, especially in Brachystegia woodland. The breeding season may be from Feb-Mar when the rains begin, since juveniles have been seen in April, July and August, and a juvenile was being fed in March. Nesting has been assumed to be high in trees, although there have been suspicions that in breeds in different habitats. The first week of January 2013, a monitoring team from Nature Kenya and Dakatcha Woodland Conservation Group visited Dakatcha Woodland IBA to look for Clarke's Weavers. The group comprised Albert Baya, Japheth Garama, Samson Katisho, Julius Mwambire, Kazungu Mboro Thuva, Samson Barisa, Maxwel Issa, Jonathan Kalama, Annet Sifa, Faith Mbago, George Odera and myself, Fleur Ng'weno. It had rained heavily in December, and many of the small wetlands had filled with water and water lilies. At about 10 am on January 6, after a survey in Brachystegia forest, we drove along the edge of a low area lush with grasses. A small part of it seemed to be deeper, with two kinds of Cyperus sedges growing in water. To our surprise and delight, we saw a flock of Clarke's Weavers among the sedges. The Clarke's Weavers were flying in and out, chattering, perching on the sedges and on a tree and bush among the grasses, then disappearing among the sedges. Small flocks flew out and disappeared over the trees, and others arrived and landed in the wetland. We estimated more than 100 Clarke's Weavers, most of them males in adult plumage. There were also some females (or possibly immature males). In the same wetland there were several Grosbeak Weavers, mostly males, with some old nests. They were displaying, singing, chasing each other and sometimes chasing the Clarke's Weavers. There was also a flock of about 40 Red-headed Quelea, mostly males, flying and landing with the Clarke's Weavers; this is a probable range extension. We observed the birds and their constant activity from our vehicle for about an hour and a half. As we did not want to disturb the birds, we left, then returned in the evening a t 5:30 pm to observe from the vehicle until about 7 pm. There was less activity, and no queleas, but small flocks of Clarke's Weavers continued to fly in and out. The Grosbeak Weavers and at least some of the Clarke's Weavers remained in the sedges at nightfall. The next morning, January 7, we were back at 5:30 am, still dark. Grosbeak Weavers became active at about 6 am, the Clarke's Weavers later. They appeared from the sedges, and small flocks flew out. As we left at about 7:30 am, a larger group of Clarke's Weavers flew in. Our last observation was in the afternoon from 4:30 to about 5 pm. At first everything seemed quiet, then a few Clarke's Weavers were seen among the sedges, and several small groups flew in. In short, we had observed Clarke's Weavers in this wetland for two days and one night. To the best of my knowledge, this is the first observation of Clarke's Weavers roosting in a wetland. (Or roosting anywhere for that matter?) The behaviour of the birds seemed to indicate they were evaluating the site as a potential breeding site. We plan to continue monitoring the site, and detailed results will be published. This observation underscores the importance of conserving seasonal wetlands as well as Brachystegia forest for the survival of Clarke's Weavers. Our thanks to Nature Kenya and the communities of Dakatcha Woodland IBA for their efforts in conservation.